Recurring Payments for PayPal Standard Add-on allows you to accept Recurring Payments from your members through PayPal Standard Payment Gateway. 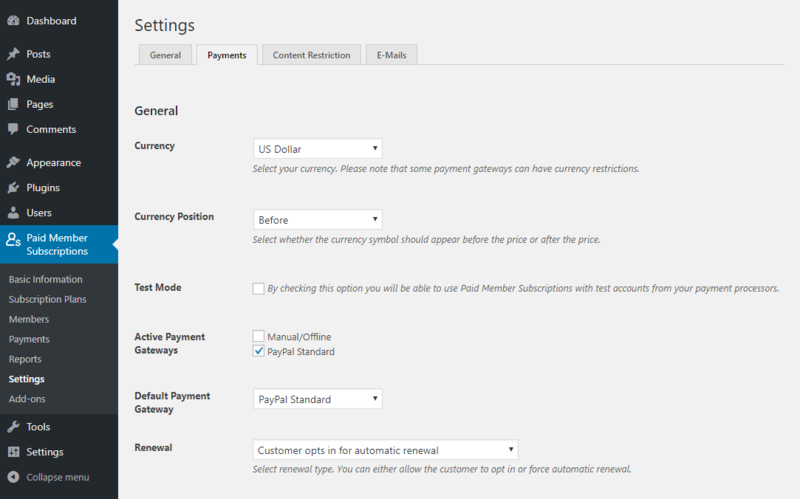 Recurring Payments for PayPal Standard is a Pro add-on, available with a Paid Member Subscriptions Pro license only. Alternatively, you can install the Recurring Payments for PayPal Standard add-on by extracting the folder found inside the archive and uploading the entire folder via FTP to your /wp-content/plugins folder found inside your WordPress install. Once the add-on is activated, navigate to Paid Member Subscriptions -> Settings -> Payments where you’ll find PayPal Standard as the Active Payment Gateway. Make sure to check the payment gateways you want to use on your site. You can also setup a default payment gateway for accepting member payments. Renewal – Select renewal type from “Customer opts in for automatic renewal”, “Always renew automatically” or “Never renew automatically”. 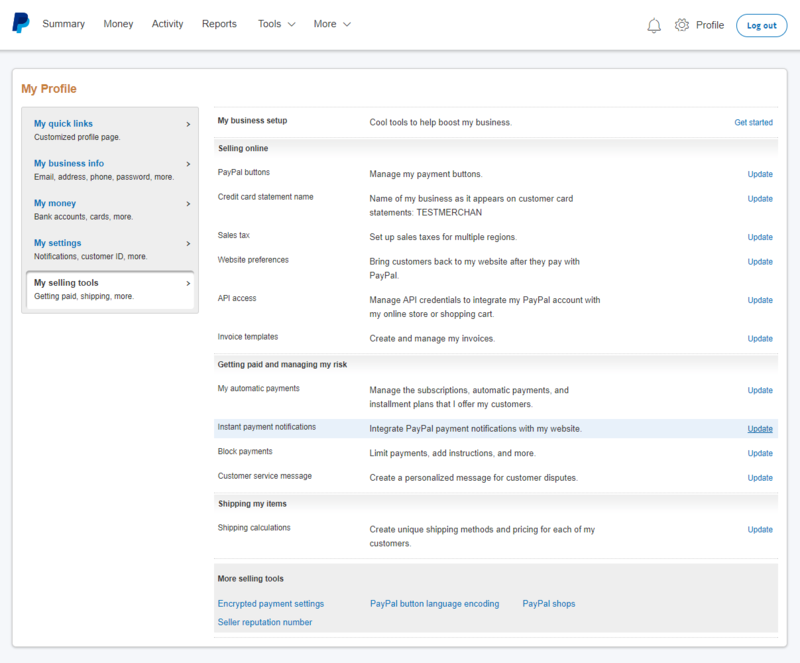 You can setup the PayPal Standard Payment Gateway to process recurring payments on your domain if you use the Recurring Payments for PayPal Standard add-on. To use the Renewal feature go to Paid Member Subscriptions -> Settings -> Payments -> Renewal. Go to Paid Member Subscriptions -> Settings -> Payment Gateways -> PayPal Standard to enter the Email Address that is connected to your PayPal Business account. Below you’ll need to enter your PayPal API credentials for PayPal Standard Recurring Payments. These are required in order to use any of PayPal Standard Recurring Payments features. 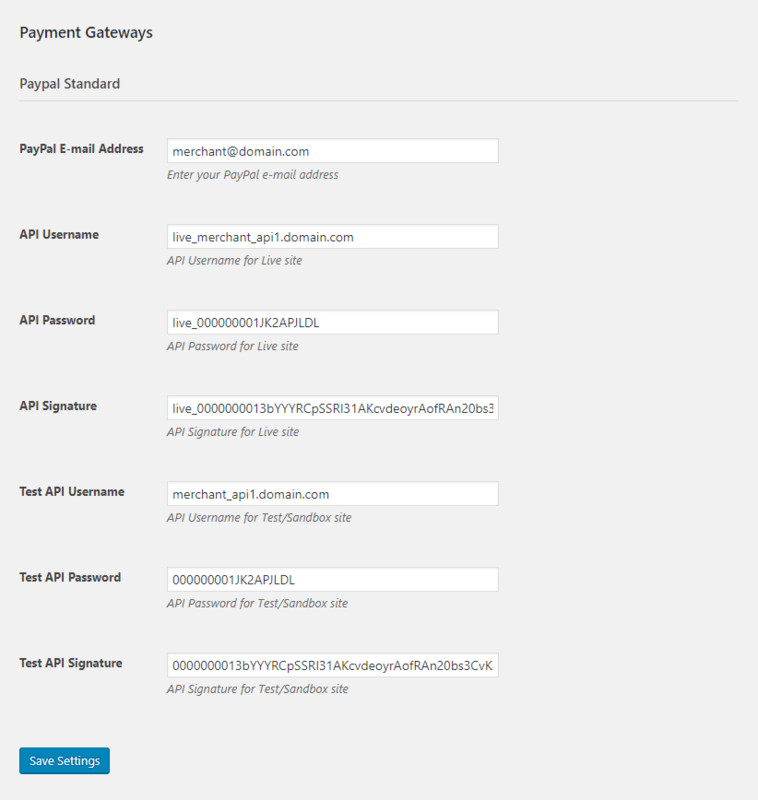 For more information on how to obtain your PayPal Live API Credentials see this guide. 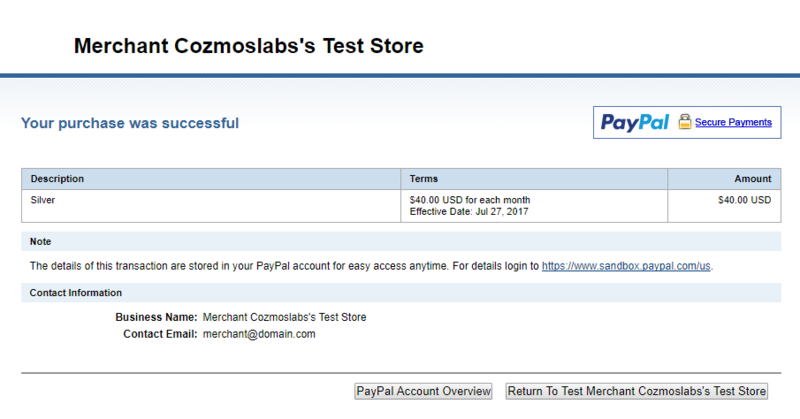 For more information on how to obtain your PayPal Test API Credentials see this guide. PayPal Standard including the Recurring Payments require that you enable IPN Notifications inside your PayPal Business Account. 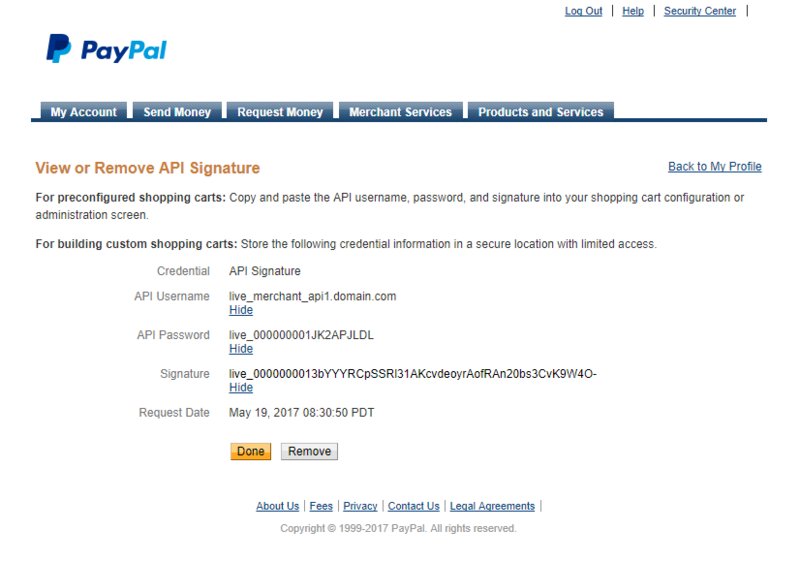 If you are using a Merchant Sandbox Account you will need to login inside the PayPal Sandbox Account to setup the IPN. 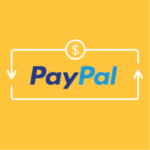 For this log into your PayPal Business Account -> Click Profile -> Go to Profile and settings -> My selling tools -> Click “Update” in the Instant Payment Notifications section. Inside Instant Payment Notification (IPN) -> Turn On IPN and set your listener’s URL. 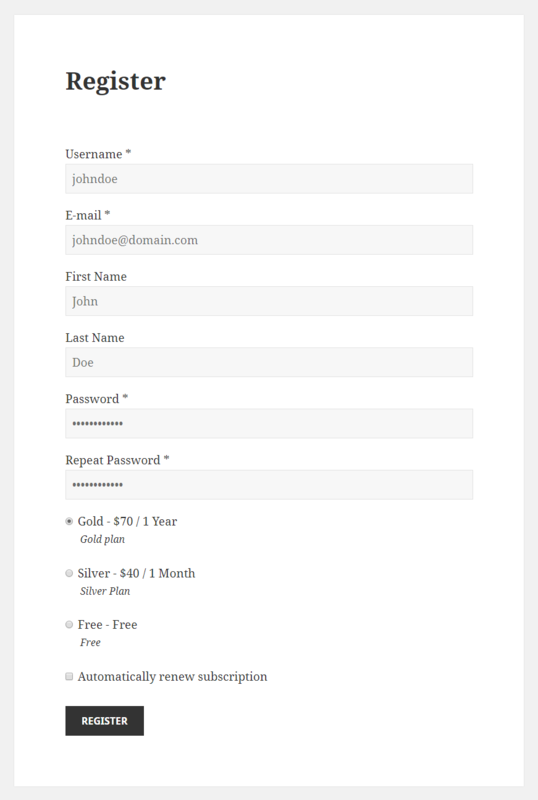 Add your domain in the field below, example: yourdomain.com, and click on the “Generate IPN” button. As you can see we need to use https for our domain. 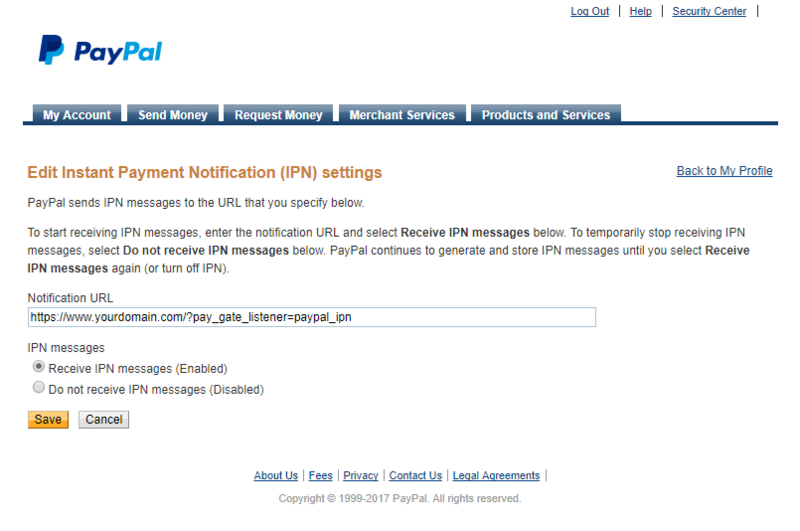 Use the generated IPN inside your PayPal Account. An SSL certificate is used to establish a secure encrypted connection. PayPal IPN has been/will be updated to https for added security in accordance with PayPal’s announcement. To avoid any disruption of service, you must verify that your systems are ready for this change by June 30th, 2017. If you’re using PayPal Standard including Recurring Payments, you must have an SSL certificate installed on your site. You can obtain security certificates for free instead of paying for traditional SSL certificates (which cost ~ 80$+/year) and install them much easier using Let’s Encrypt. It is a free, automated and open certificate authority that issues domain-validated certificates. More and more hosting companies (like Site Ground or Kinsta – quick tutorial) offer the ability to install let’s encrypt certificates in just a couple of clicks directly from their dashboard. The most secure protocol for sharing information on the web today is Transport Layer Security (TLS) version 1.2. 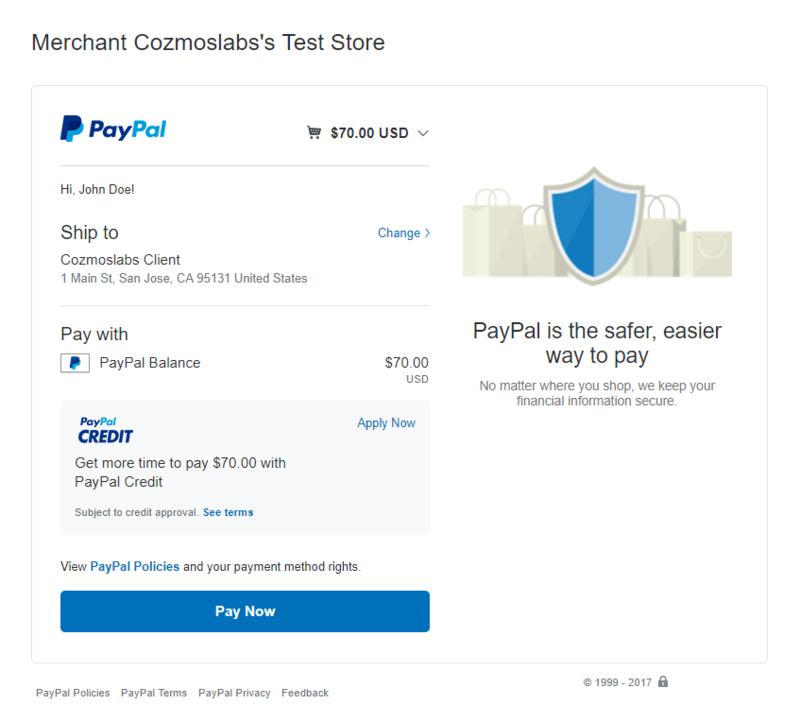 PayPal is enabling support for TLS 1.2 for all secure connections and in 2016 will start requiring its use. You will need to verify that your environment supports TLS 1.2 and if necessary make appropriate updates. PayPal is updating its services to require TLS v1.2 for all HTTPS connections in June 30th, 2017. After that time, all TLS v1.0 and TLS v1.1 API connections will be refused. As the Security Notice from PayPal says, please contact your hosting and tell them to update the TLS of your SSL Certificate to v1.2. Also tell them that there is an issue with SSLv3 that is preventing PayPal to work correctly. A suggestion would be to disable SSLv3 in order to see if the payments are processed correctly. After you install your SSL Certificate on your domain please go to your website -> Login as Admin -> Access the dashboard -> Settings -> General and make sure you add https inside WordPress Address (URL) / Site Address (URL). Also we recommend to use a free plugin like Really Simple SSL – It automatically detects your settings and configures your website to run over https. 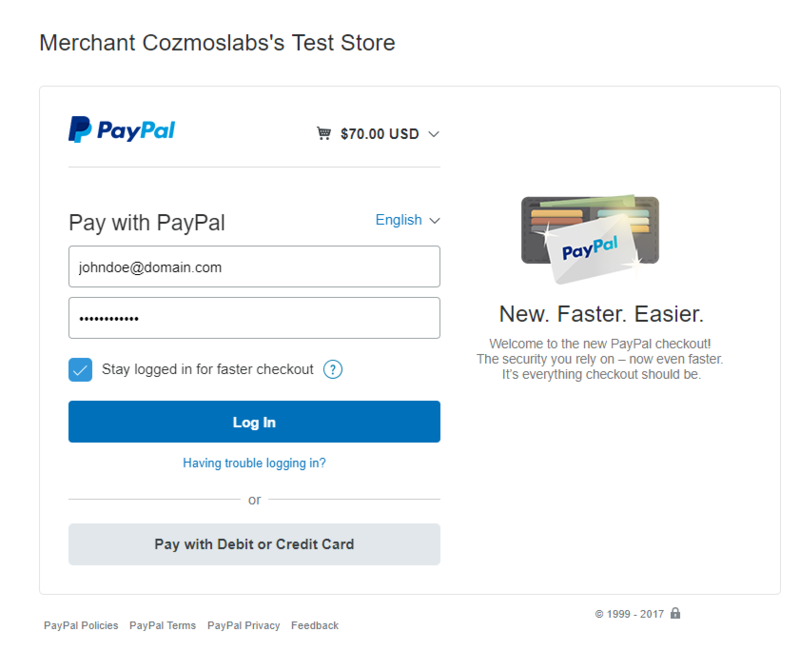 If everything is setup correctly, including the PayPal API Credentials and the IPN, we can process our first PayPal Standard payment on our website. 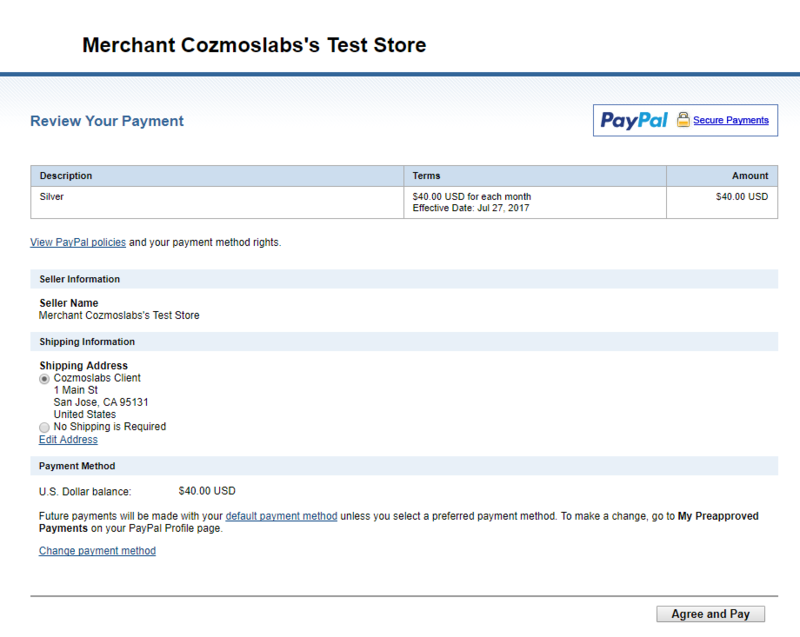 We will test the payments by using Paid Member Subscriptions in Test Mode. 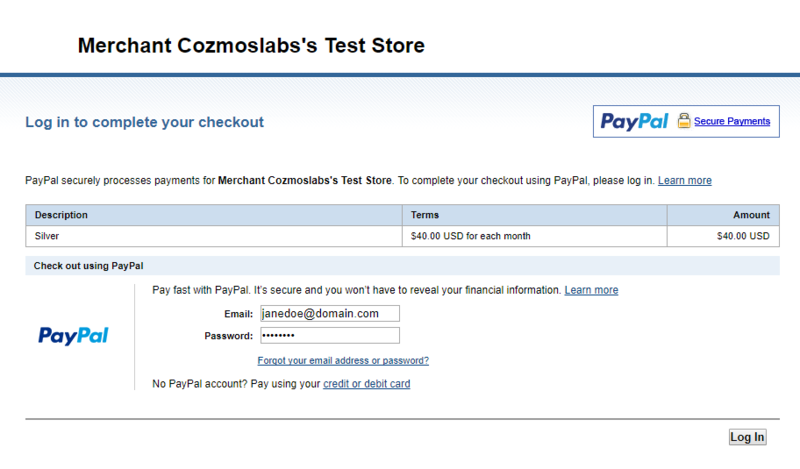 Go to Paid Member Subscriptions -> Settings -> Payments -> Check “Test Mode”. By checking this option you will be able to use Paid Member Subscriptions with test accounts from your payment processors. 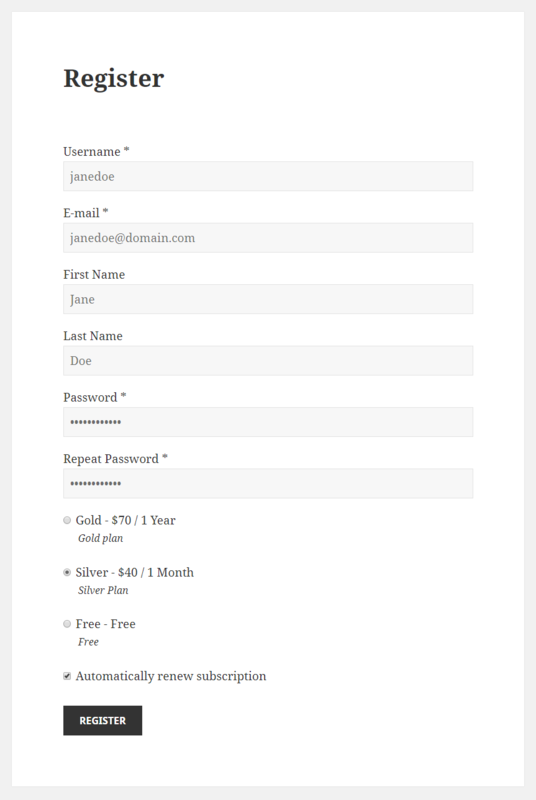 Inside our Registration form we display 3 Subscription Plans: Free, Silver and Gold and the Renewal option is set to “Customer opts in for automatic renewal”. After registration the user will need to login inside his PayPal Account. After login the user will need to confirm the payment by clicking on the “Pay Now” button. By clicking on the “Pay Now” button we complete the purchase. This is how the payment looks like in Paid Member Subscriptions -> Payments. To make a recurring payment when the Renewal option is set to “Customer opts in for automatic renewal” the user will need to check the “Automatically renew subscription” checkbox. After login the user will need to confirm the payment by clicking on the “Agree & Pay” button. By clicking on the “Agree & Pay” button we complete the purchase. A PayPal API operation can return multiple error and warning codes. You can view the full list here. If you receive an 10002 PayPal Error when trying to process a payment with PayPal Pro or PayPal Express Checkout it means that your API Credentials are not setup correctly. Check that the account that will receive payments was used to generate the API credentials. 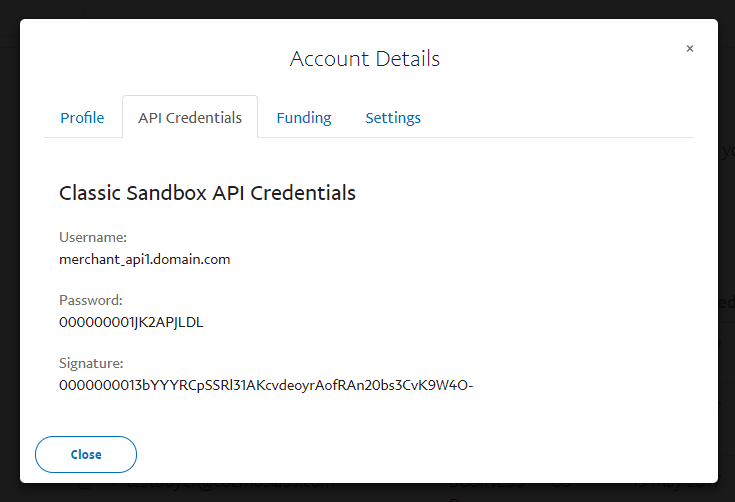 If you’re using PayPal’s Sandbox environment, you must generate API credentials from within the Sandbox business account rather than a Live account. You can read more about this here. If you receive an 11586 PayPal Error you will need to get in touch with PayPal Business Support to request this feature to be enabled for you. Mention that you’re looking to get “Direct Payment – Recurring Payments” enabled. Read more here. Also make sure to tell PayPal to update PayPal Pro to the latest version on your account. Enabling Direct Payment – Recurring Payments may include additional PayPal fees – $30/Month. Lets say that you setup Paid Member Subscriptions to process payments using the £ (Sterling Pound) currency. You will need to make sure that your PayPal Account uses this currency otherwise all your payments will be considered pending. This is required also for Test Merchant Accounts. 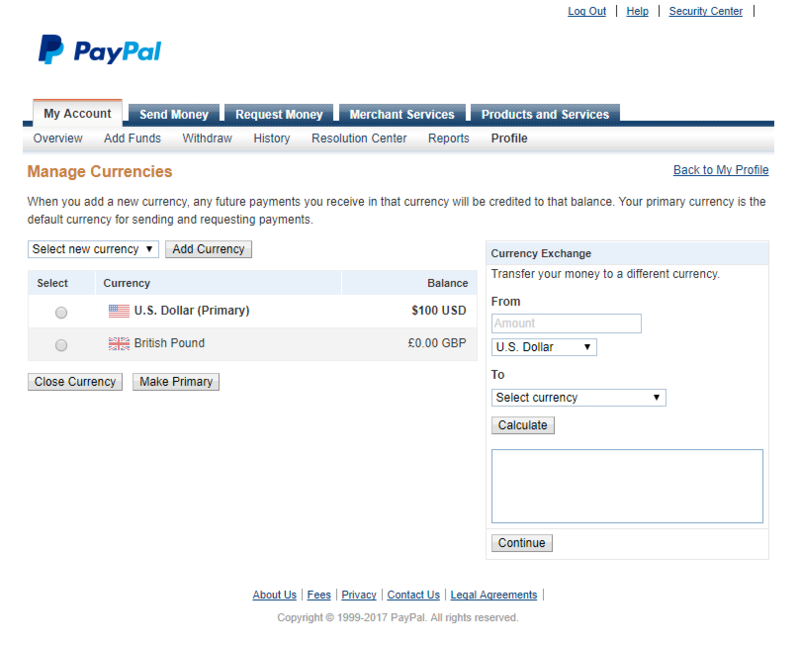 To add a currency login inside your PayPal Account -> Currencies -> Select new currency -> Select British Pound -> Add Currency.